Its highest-volume growth in a decade gave investors reason to expect market-thumping profit gains ahead. Clorox (NYSE:CLX) stock rose 14% last month, according to data provided by S&P Global Market Intelligence. The rally left the consumer products giant just below a new all-time high and put further distance between it and industry rivals like Procter & Gamble (NYSE:PG). Clorox shares jumped in response to surprisingly strong fiscal second-quarter earnings results. Sales volume was up 8% behind double-digit growth in its home care division, which houses the hit Clorox disinfectant wipe franchise. That result was good enough to mark the highest volume gains for the company in nearly a decade. Profitability expanded as well, ticking up to 44.7% of sales from 44.6% a year ago. "We feel good about our strong sales results to date," Chief Financial Officer Steve Robb said in a press release, "and look forward to continued topline momentum in the second half of the fiscal year supported by our upcoming new product launches." 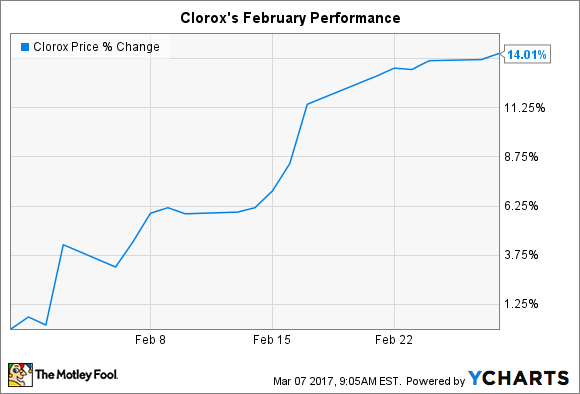 Clorox raised its full-year outlook to between 3% and 4% from the prior forecast of between 2% and 4%. The boost should keep the company firmly in market share expansion territory. Procter & Gamble, after all, is projecting a range of between 2% and 3% organic growth for its 2017 fiscal year as its laundry and home care division expands by roughly 2%. To hit its aggressive targets, Clorox is counting on momentum from its home cleaning brands and a significant boost from the recent acquisition of the RenewLife business. Optimism around its improving business trends has pushed the stock up 20% in the last three months. Yet, given that the company is enjoying record volume growth and steadily rising profitability, investors have good reasons to bid up the shares.